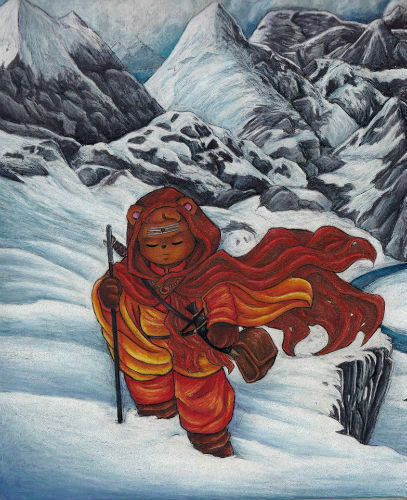 Baba Bhalu also known as Swami Bhalunath is a teddy bear warrior monk from the mysterious Shambala hidden beyond the Himalayas. As the new time cycle (Yugh) dawned, Bhalu was sent forth on a secret mission by his Guru. His mission: to fulfill an unknown destiny guided by the Earth Goddess ( Gaia) in her various guises. Baba Bhalu is joined by Guthrie Gale, AKA Gothy, a talented eccentric tech prodigy and cyber rebel without a cause. Together, they form an unlikely music duo embarking on adventures. Aboard their underground space-time shifting temple, they teleport across the Earth's hidden ancient energy grids, hunting down the dark forces that lure mankind into a web of algorithmic mind control eventually leading to an ecological dystopia. Spiritual magic: Bhalu's in depth knowledge of mystical wisdom gives him the ability to decode the meaning of synchronized events. His ability to "tune in" also helps him to carry a tune as a heart stirring musician. Spiritual energy: He has been trained in various spiritual practices that have given him abilities or psychic powers. Martial arts: He is trained in different forms of martial arts and combat.When he is not meditating or making music Bhalu also enjoys staying fit by mastering yoga, and parkour techniques enabling him to climb up walls and jump roof to roof. He is overall extremely fit. Weaknesses: Worries about getting angry and suddenly going out of control. Also has a complex about his being a teddy bear and not aways taken seriously. 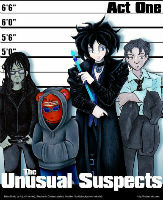 Paraphernalia: He has some weapons from his past which he keeps hidden but the one he keeps with him are his nunchucks.